Smart functionality and contemporary design. Its unique ceramic mechanism grinds salt, pepper, linseed, curry, chilli, basil, dried shallots, spice and herb mixes and more. 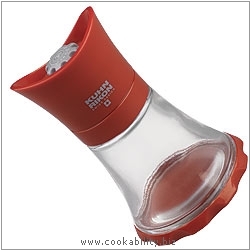 Now you can keep your favourite spices and mixes at the ready for grinding fresh daily. Ceramic mechanism stays sharp and does not rust. Easily adjusts for fine to coarse grinding. Container is easy to refill with different spices. Upside-down design keeps counters clean. Not for use with cloves or anise as the oils released may damage the grinder.